My first visit to The Spice Table wasn’t a great one. I came to the restaurant with high expectations and left feeling mostly underwhelmed after a lunch of wings, coleslaw, and Vietnamese sandwiches. 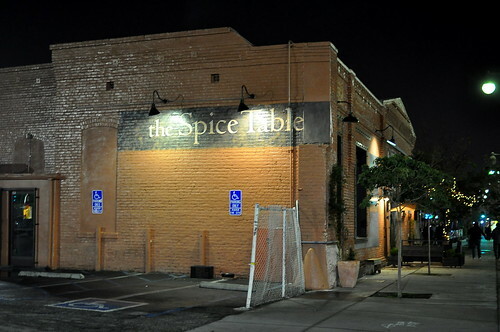 Although The Spice Table’s dinner menu is a completely different beast, I didn’t have any desire to try it after my initial introduction. Sometime last December, I received a $50 voucher from the Malaysia Kitchen Los Angeles campaign* to dine at one of their partner restaurants. 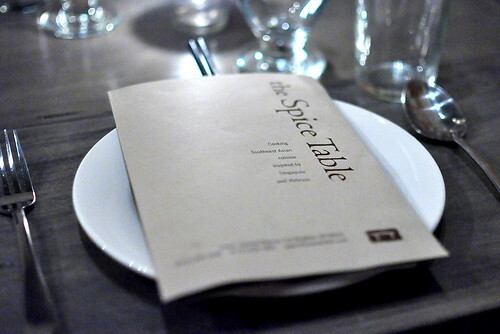 I selected to return to The Spice Table after skimming the list of eateries participating in the program. While the voucher wasn’t enough to cover the entire cost of dinner there, it provided me with the incentive that I needed to give the restaurant another try. I was hoping for an altogether better experience this time around. The Astronomer and I bypassed the official Malaysia Restaurant Week menu and chose a suite of dishes that sounded delightful to us. The beef tripe ($10) from the “Satays” portion of the menu was the first to arrive. 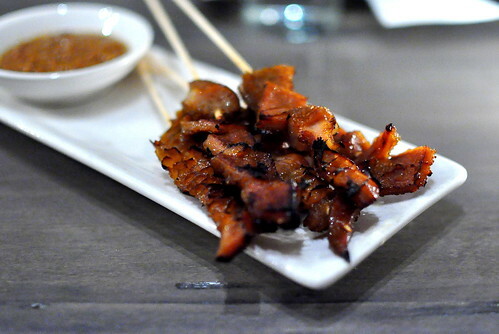 Marinated in soy, garlic, and palm sugar, the tripe was impressively tender and surprisingly sweet. While I’ve always had a thing for a tripe, The Astronomer has been more hesitant to open his heart. He declared these skewers to be the best preparation of tripe he’s come across. The lamb belly skewers came to the table shortly after. Served hot off the grill, the lamb was seasoned with a delectable blend of cumin, galangal, and turmeric ($10). The musty essence of lamb was awesomely assertive in this preparation. Midway through the satays, kaya toast, fried cauliflower, and creamed kale came on to the scene. A crowded table often makes me feel overwhelmed, but in this situation, the array of flavors and textures was completely welcomed. 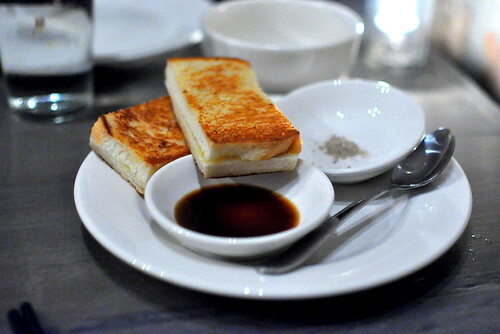 The kaya toast ($7) came from the “Snacks” portion of the menu. It was impossible not to adore the coconut jam on buttered toast served with a slow cooked egg, soy sauce, and white pepper. 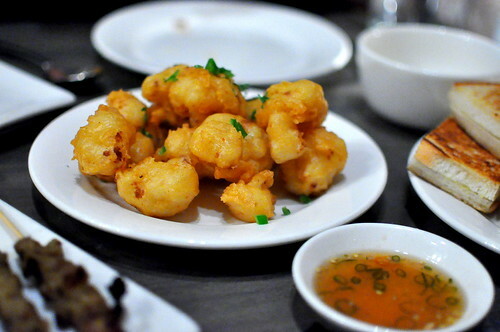 Coated in a light and golden tempura batter, the fried cauliflower ($7) was equally loveable. The accompanying fish sauce vinaigrette, which tasted similar to Vietnamese nuoc cham, brightened up the fried florets perfectly. 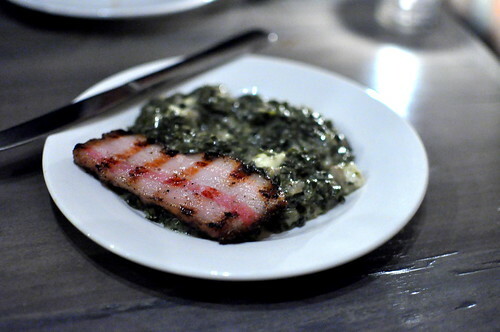 The Astronomer man-handled the creamed kale with grilled paneer and house-cured pork belly ($10). The few bites that I stole were unabashedly rich; rice would have balanced the flavors out nicely. Moving on to main courses, we shared the shortrib beef rendang ($16) served on a bed of jasmine rice upon a banana leaf. 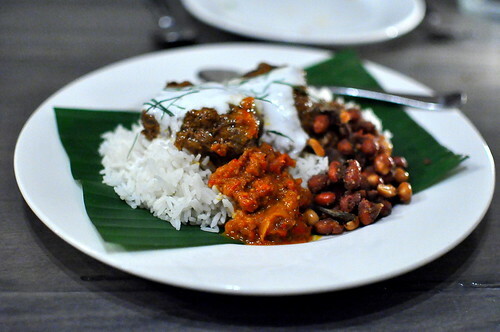 Sambal, coconut milk, and a curiously addictive peanut and anchovy mixture garnished the plate. This was my first introduction to rendang, and dang, I’m totally sold. The flavors were right up my alley: bold with a tinge of funk. 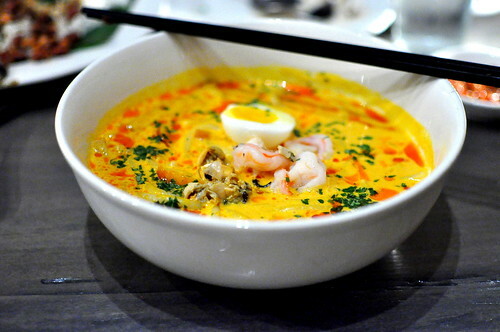 We also shared a large bowl of curry laksa ($12), which consisted of slippery rice noodles swimming in a spicy coconut-seafood gravy. Half a hard boiled egg, as well as fish cakes and shrimp, further accented the bowl. The coconut gravy, which had a pronounced fishy undertone that I neither loved nor loathed, was really, really rich. It was a good noodle soup overall, but much too heavy considering everything we had eaten prior. This superb dinner more than made up for the mediocre lunch I endured months ago. 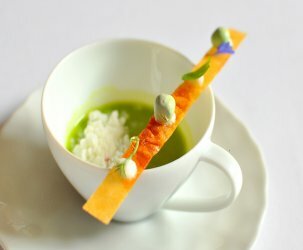 The service was warm and attentive, while the food showed flare that I knew Chef Bryant Ng had in him. Consider me a Spice Table convert. * Malaysia Kitchen Los Angeles, as part of the Malaysia Kitchen for the World initiative, seeks to promote Malaysia’s uniquely delicious culinary fare throughout Los Angeles and Orange County. The campaign partners with a variety of local restaurants to promote their Malaysian cuisine offerings. 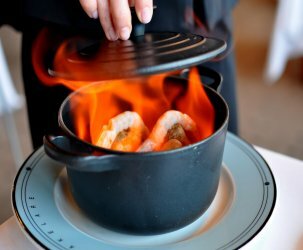 Malaysia Kitchen for the World is a global initiative of the Malaysian government that aims to educate and inform consumers about Malaysian cuisine and Malaysian restaurants throughout the world. 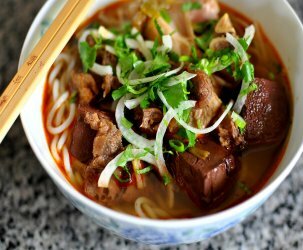 The Los Angeles campaign seeks to boost interest among American food lovers to try Malaysian cuisine and visit Malaysian restaurants in the Los Angeles metropolitan area. how nice you got to give this place another try. sounds like dinner is the way to go! I’m glad to have been a (small) part of this meal! 🙂 the tripe sounds amazing. 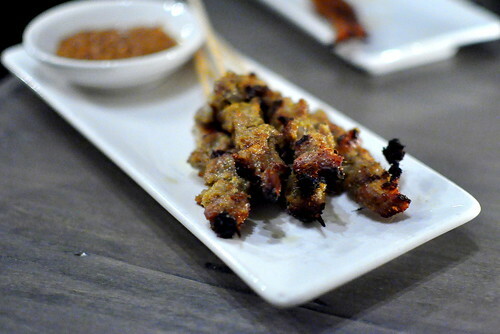 I had lamb skewers in Shanghai and they were so amazing! They were so tender and full of spicy cumin seasoning, so tasty. I wish I had some fluffy naan bread or something.